With so many moving parts, it’s no wonder something with your garage door goes wrong from time to time, leaving you in need of a prompt and professional repair. This is where we step in! We will come to your rescue when your door gets jammed, won’t open properly or at all, or is in need of general maintenance and a tune-up. Count on us to repair, replace, and install any moving or stationary parts of your mechanism in no time, following our high standards of practice. We often receive calls from panicked homeowners saying their opener has broken and needs to be replaced quickly. The good news is most of these calls are based on a quick and simple repair. Chances are we’ll be able to fix the issue in a single visit, as we hold a vast range of replacement parts at hand to get your door back in action as soon as possible. 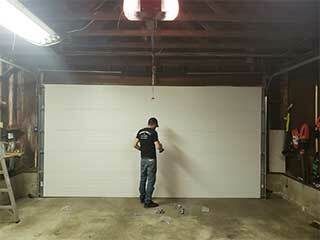 Your sensory beams, albeit small, play a vital role in the operation of your garage door. If something is in the way of their signal, the door will reverse halfway down or might stop a few inches off the ground. We’ll carefully inspect your beams to determine their transmission is unobstructed and they’re working as they should. We specialize in repairing and replacing your broken panels so that you don’t have to replace the entire door. We want everything to work and look well when it’s put together, and for that reason maintain an exhaustive inventory of spare parts which we can install for you in a single visit. In case your door is a one-of-a-kind, we’ll do our best to source the exact panels to match the existing design. We are only a call away and so is the resolution of your garage door problem. If you’ve got any questions or concerns about our process and your repair, our experts will gladly answer those.